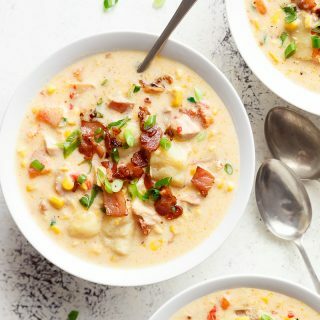 Thick and creamy Corn Chowder with crispy bacon, chicken, potatoes, cheddar and mozzarella! Slow Cooker OR Instant Pot! Our Corn Chowder has so much flavour they’ll be going back for seconds or thirds. Now this is a family favourite! The recipe includes methods for a Slow Cooker or Instant Pot and is now on VIDEO! What sets this chowder apart from most is the addition of potatoes, which is what gives this soup the thickness and creaminess without needing heavy cream. Of course, you CAN add cream if you want too, for an extra and even bigger creamy flavour, BUT it’s not needed. 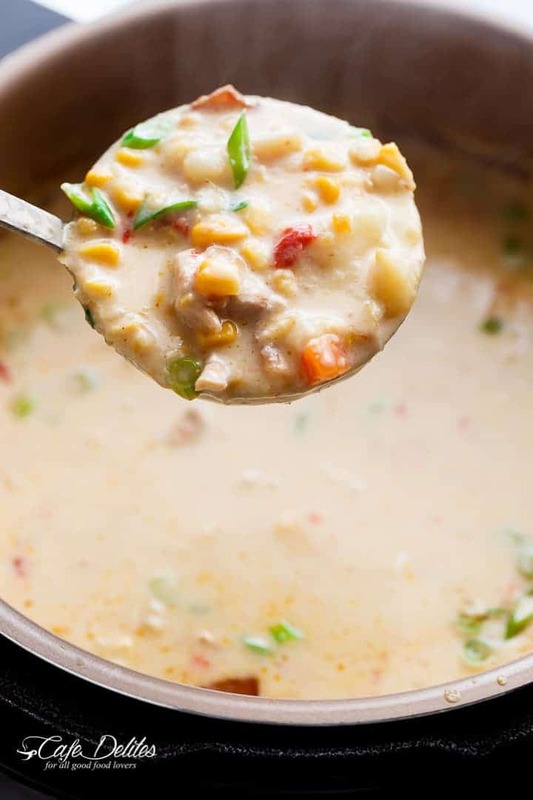 Taking full advantage of the abundance of fresh corn available where we both live, this THICK and CREAMY Corn Chowder can be made with fresh corn, frozen or canned corn. 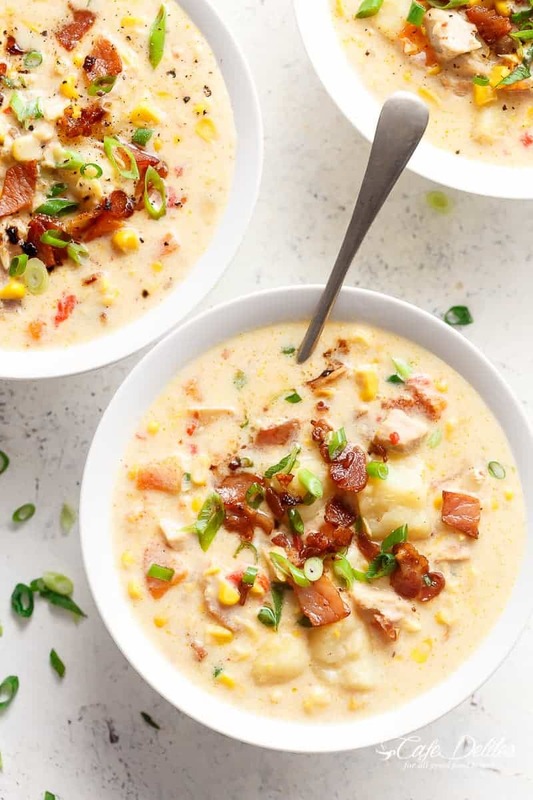 Corn Chowder is a thick and creamy bowl of soup with textured or chunky ingredients throughout. 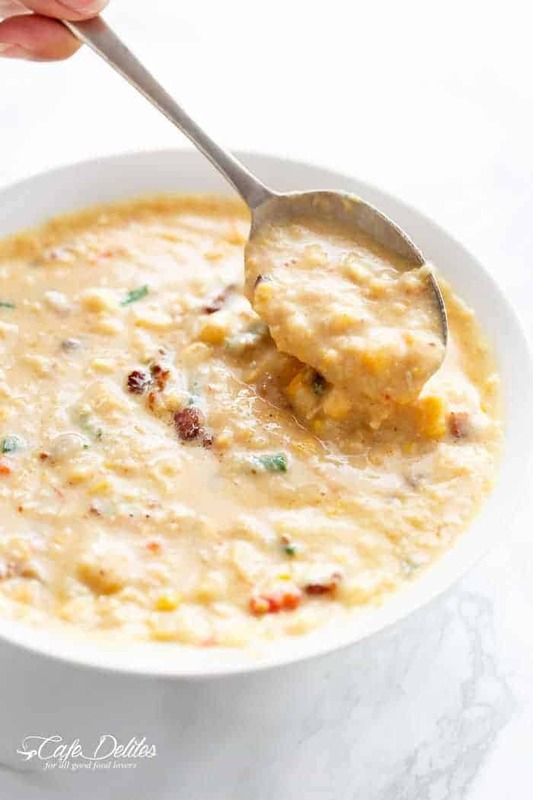 Another added element in our corn chowder recipe is creamed corn, which I have found over the years lends an even better flavour to this chowder. Whether using a slow cooker or instant pot, first you will sauté your chicken to get it crisp and golden. If using a slow cooker, do this in a separate pan (if your cooker doesn’t have a ‘sear’ function). For IP’s, sear in the pot before setting it to pressure cook. One pot to wash. No pans or skillets! After that, throw most of the ingredients in to continue cooking until the potatoes are fork-tender. Sprinkle it over the top with chives and extra fresh corn. And dinner, thanks to your Slow Cooker or Instant Pot, is served. For fresh corn, you will need 4 ears corn. If using frozen corn, make sure the corn is thawed. For canned corn, drain and rinse before adding to the chowder. Chicken Bacon Corn Chowder with crispy bacon pieces and mozzarella cheese! As simple as throwing ingredients into a Slow Cooker or Instant Pot! Sear chicken in a skillet or pan over medium heat to brown all over, then transfer chicken to a 6qt slow cooker bowl. Add the diced onion, carrots, red peppers (capsicum), corn, creamed corn, potatoes, chicken broth and garlic powder. Stir and cover with lid; cook on slow cooker high setting for 3-4 hours or low setting 6-8 hours. When potatoes are fork tender and chicken is falling apart (45 minutes before the end of cooking time), stir in the cream. Whisk together the cornstarch and milk and mix it into the soup. Cover and allow to thicken on high heat setting. Use a potato masher to further thicken the chowder. Stir in salt and pepper to taste; add in the cheese; top with the bacon; garnish with fresh chives or sliced green onions and serve. Cook bacon on high sauté setting until golden (about 6 minutes). Use a slotted spoon to transfer to paper towel-lined plate. Cook the chicken in the bacon fat on the same setting. Add the diced onion, carrots, red peppers (capsicum), corn, creamed corn, potatoes, chicken broth, garlic powder and half of the bacon. Stir well. Close the lid, turn the valve to seal. Adjust pressure to high on manual setting for 10 minutes. Once cooked, quick-release pressure according to manufacturer’s instructions. Remove lid. Set to high sauté setting and bring to a boil. Stir in the cream. Whisk together cornstarch and milk and stir mixture into the soup. Stir frequently while simmering for about 4-5 minutes until thick and creamy. Use a potato masher to further thicken the chowder. Stir in salt and pepper to taste; add in the cheese; top with the remaining bacon; garnish with fresh chives or sliced green onions and serve. Please keep in mind that this chowder will thicken a little more while it sits and cools to room temperature. Add a little broth, water or milk when re-heating. Hi!! Do you have a recipe for corn chowder alone?? I am dying for one. I made the butter scallops and the stuffed mushrooms, deeeelish!! Next time I will add crab instead of the sausage. Not yet Denise, so sorry. You could make this one without the chicken and bacon. Can I use chicken breasts instead of thighs. Thanks. Ron. Yes, chicken breast should work out just fine as well. Thanks for taking the time to try a recipe and for following along with me! I have made quite a few of your recipes, including this one, and have loved them all so thank you! My question for you is, does this soup freeze well? If so do you have any tips or tricks as I know cream based soups sometimes separate when defrosted. Thank you again!! I made this chowder and it was great and everyone loved it. I omitted the red peppers because my family doesn’t like them. I also froze some and that was great too when reheated, just added a little chicken broth. Yes, please add it if you are wanting it in the recipe. I made this with a different twist but it will still taste great! I love a creamy based soup!!! Excellent recipe and perfect for a cold day. I did not add potatoes as I am trying to reduce carb intake. This is a keeper for my house! Thank you!!! How would you convert this for the IP? Thanks! Can you freeze this soup? I always make big batches of soups and freeze them, easy meals on cold days!!! Can’t wait to try this recipe sometime this week. 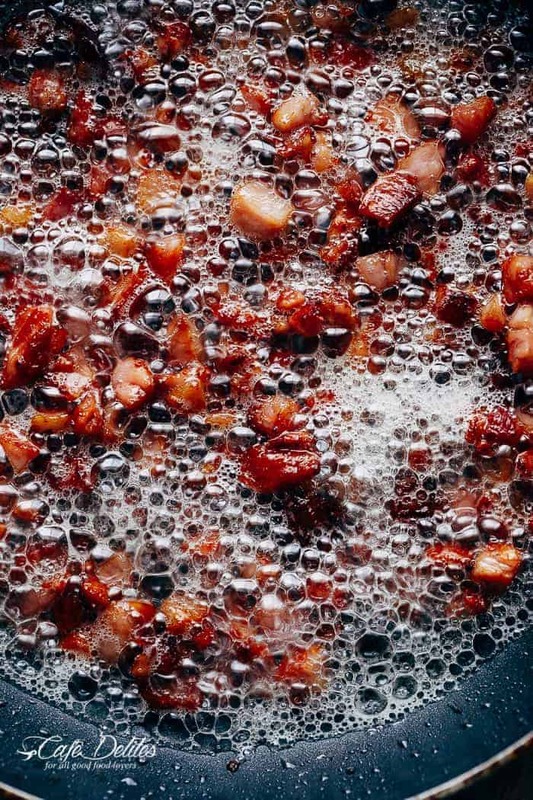 I’m new to your blog and I’m scrolling through and finding so many recipes that I will try for the 1st time. Thanks for accepting me. I didn’t want to wait until tomorrow to make this so it is cooking on the stove right now. It is just now cooking with the broth but the taste is amazing! Thanks for posting the recipe. ?? You’re very welcome Susan! Enjoy! There are a few recipes I would like to copy for my own use. My husband saw the corn chicken soup recipe and wants it for supper later this week when it is cold. Hi! Just want to ask what I need to do should I do not have a slow cooker or pressure cooker w me in making tbis soup?